1. 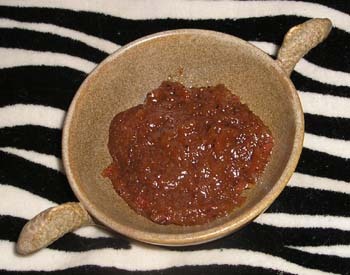 Fadalat indicates that macerated murri was prepared at the end of March in fair weather. The recipe calls for grinding whole barley grains, which have begun to germinate. The mass is kneaded into dough without salt and shaped into round balls. A hole is placed in the middle of each with a finger. Then they are wrapped in fig leaves and air dried in the shade for 20 days until the bran has turned into powder. These were stored in fig leaves until used as a condiment. Normally they were crumbled prior to adding to the recipe. Concocted from David Friedman and Elizabeth Cook’s Cariadoc and Elizabeth's Recipes. 1988, 1990, 1992.
and Lilia Zaquali’s Medieval Cuisine of the Islamic World, U of California Press. 2007. pp 55-56. Warming ingredients may be harmful to health. If you do not live in a place with conditions like Murcia, Spain, go there in the beginning with the last solar days of March to stay until the end of autumn. Find a place with access to a fig tree and well enough away from neighbors because this recipe stinks! Extreme care must be taken to wash hands and body before working with the required substances. Body odors transmitted to the ingredients can ruin the recipe. Combine the flours. Add hot water. Knead well, roll into balls. Poke a hole in the middle of each. Wrap in fig leaves. Powder them with bran and sun-dry for 40 days. Every dawn and sunset unwrap the balls, scrap off mold and split. Knead them. Powder them with bran and wrap in fig leaves. When dry and black grind them. Mix them with carob bean powder, honey, salt, herbs and spices. Place this in air-tight jars with an equal amount of water and seal with animal hides. Stir every morning and evening until the end of autumn. During this period, every three days, add bread that has been slightly cooked, dried in the oven and grated. When all really stinks, strain and filter the mixture producing a dark bitter liquid, almost black. This is stored in a porcelain dish, which is glazed on the inside. This is considered the best batch. The residue is kept for preparing the next batch. Other recipes for murri can be found in almorí and almorí de pescado.